Montana running back Adam Eastwood clutches the ball as he is hit by Montana State defensive line Zach Wright during last year's Brawl of the Wild at Washington-Grizzly Stadium. Eastwood is hungry for redemption after his fumble sealed Montana's fate late in the Griz-Cat game. 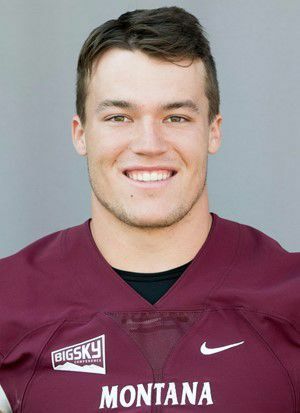 MISSOULA — Montana running back Adam Eastwood will forever be the answer to a trivia question about the ending of the 2018 Brawl of the Wild football game. His fumble on the 1-yard line in the closing seconds not only cost the Griz a win and a potential playoff berth, but it resulted in one of the worst or one of the best finishes — depending on who you ask — in the 118-year history of the heated rivalry between Montana and Montana State. Even though Eastwood was new to the in-state showdown after transferring from San Diego State, he knew he let down the team and fans in a major way. But the redshirt sophomore has three more years of eligibility in which he can work to help the team reach new heights and ensure that his legacy will be much more than and much brighter than that single play as he tries to turn hurt into hope. “It was tough,” Eastwood said after practice last week as he reflected on the play for the first time in an interview. “It’s still tough. I’m my hardest critic. Whatever people said, it doesn’t matter. I'm hardest on myself. They can't say anything that I haven’t already said to myself in my head. The healing process has been a long one for Eastwood. He was initially down on himself. He heard how upset fans were in the hours and days after the game. And the play stuck in his head as he continued to think through what happened. Then Eastwood finally saw the ending on film. He had scored, and the Griz were possibly going to the playoffs. But Montana State was ruled to have called a timeout. So, the Griz lined up again, handed off the ball to Eastwood, and he was met in the backfield, where he fumbled to end the season. Griz quarterback Dalton Sneed, who handed off to Eastwood on the play, got an up-close look at how distraught Eastwood was after the fumble. He’s also seen him start to bounce back. Eastwood is the lone returning running back who had meaningful reps last season. Montana brought in junior college transfer running back Marcus Knight, and the two of them could headline the young group as they compete for and possibly split reps.
Now 12 practices into spring camp, Eastwood has been working on ball security, making his reads quicker and keeping his balance to stay on his feet when taking contact. Ball security may seem like an obvious area to work on, but Eastwood said making quick reads was “another big focus” because he felt too slow doing that last year. That hesitancy can be traced back to him playing in a wing T offense in high school where each play called for him to hit a specific hole as hard and fast as he could. Playing in Montana’s zone scheme, he has to read blocks quickly and find the most proper hole to run through. The path toward redemption continues with the spring game this Saturday in Kalispell. Then it’s nearly four months before fall camp picks up in August, followed by the season opener on Aug. 31 at South Dakota. As for what Eastwood wants to prove to himself, his team and anyone who watches him play when he returns to the field on game days, it’s pretty simple.